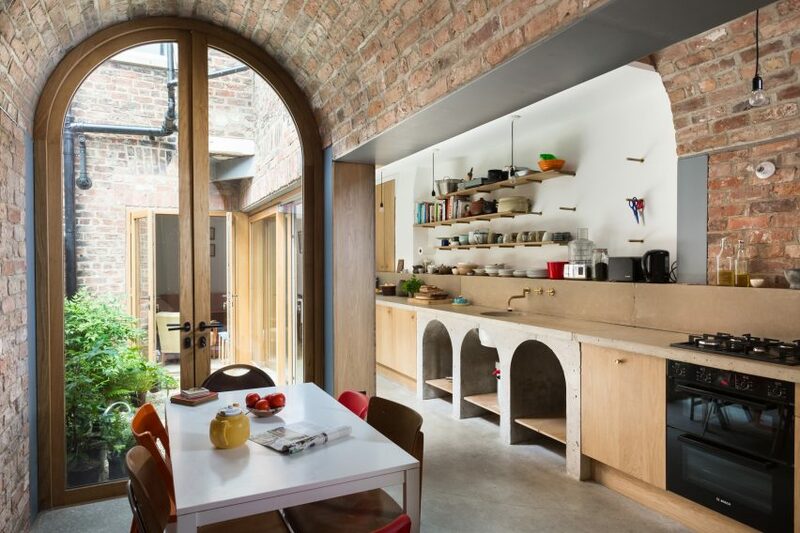 Two arches made from handmade bricks form an extension at the rear of this Victorian terraced house in York by London practice Studio Ben Allen. 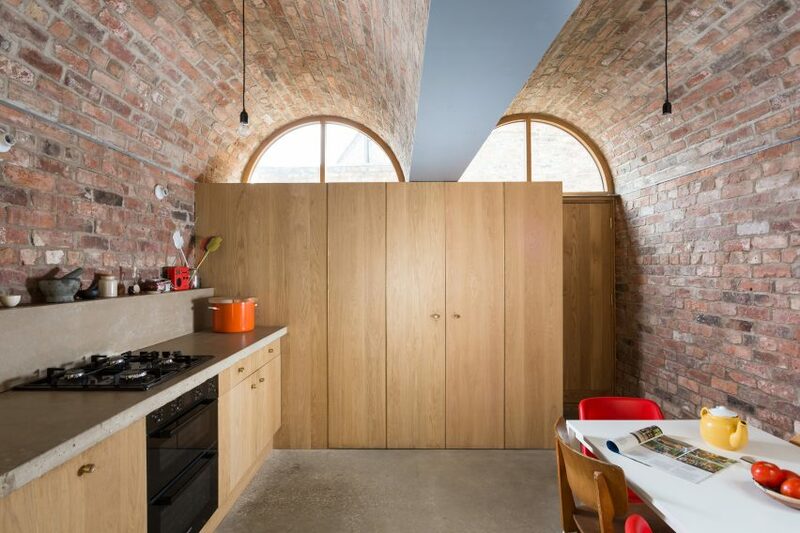 Studio Ben Allen used locally made bricks to build the two barrel vaults at the back of the L-shaped property located near the River Ouse. “It was the simple beauty of these rear spaces, a landscape almost completely of one material: brick facades, yards and lanes that was the inspiration and departure point for the design,” studio founder Ben Allen explained in a statement. 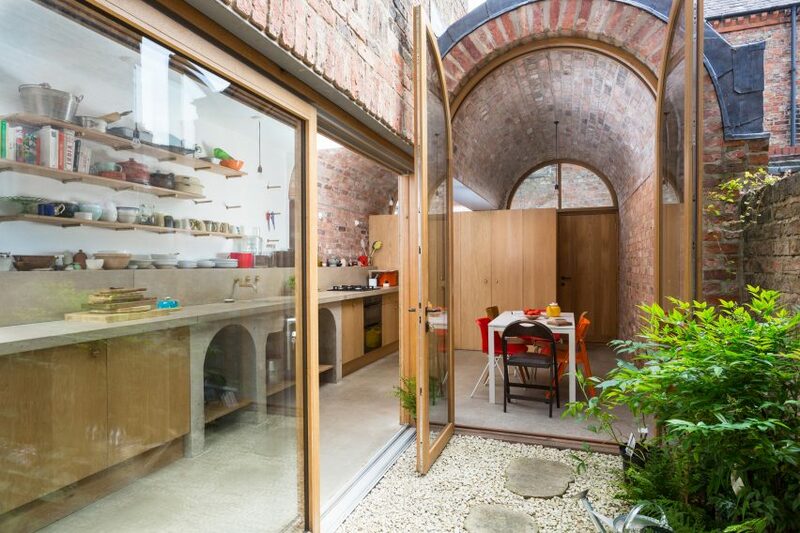 Filling the back yard, the extension has added room for a kitchen, living and work space under the arches, while a courtyard surrounded by glass doors and walls on three sides allows further daylight into the house. Full-height glazed doors at one end of the vaults frame views of the paved pathway and greenery, while windows at the others allow light to fill the extra room. The arch form has been carried through to the interiors as a design motif. 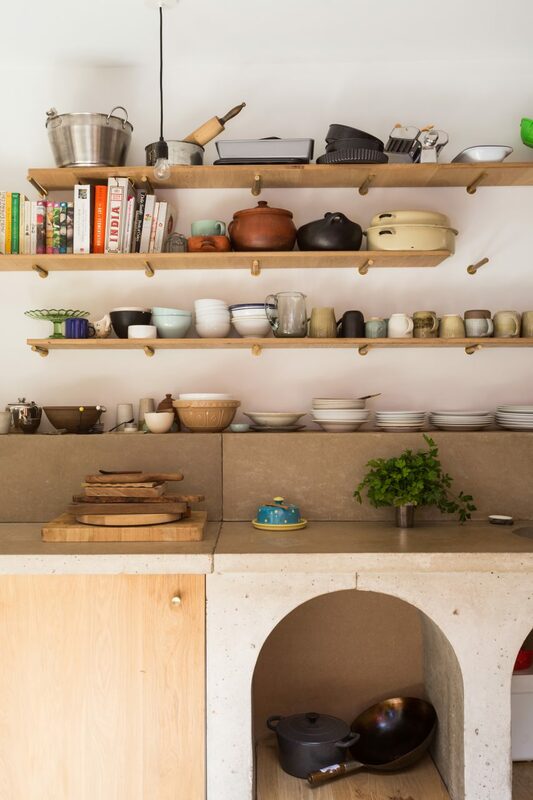 The slabs of the concrete countertop are supported by three concrete arches, which have been lined with oak to create open storage areas for pots and pans. 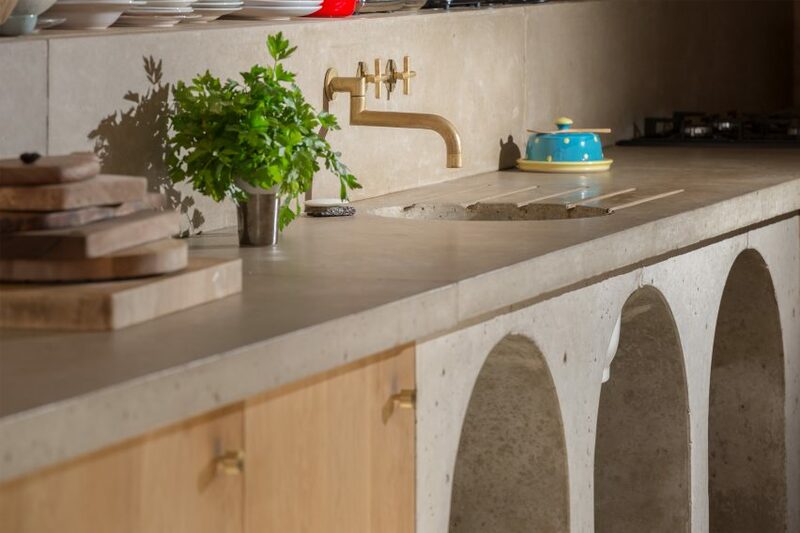 More typically used as a sub-floor, the kitchen floor is made from cement screed with heating elements laid underneath to keep it comfortable underfoot during the North Yorkshire winters. Cupboard doors are made of solid oak, and a bike store was installed at the back under the vaulted ends of the extension to accommodate the clients love of cycling. The kitchen bins are also discretely tucked away in here. Upstairs, the arch theme continues in the shape of two curving mirrors affixed over the his-and-hers sinks. 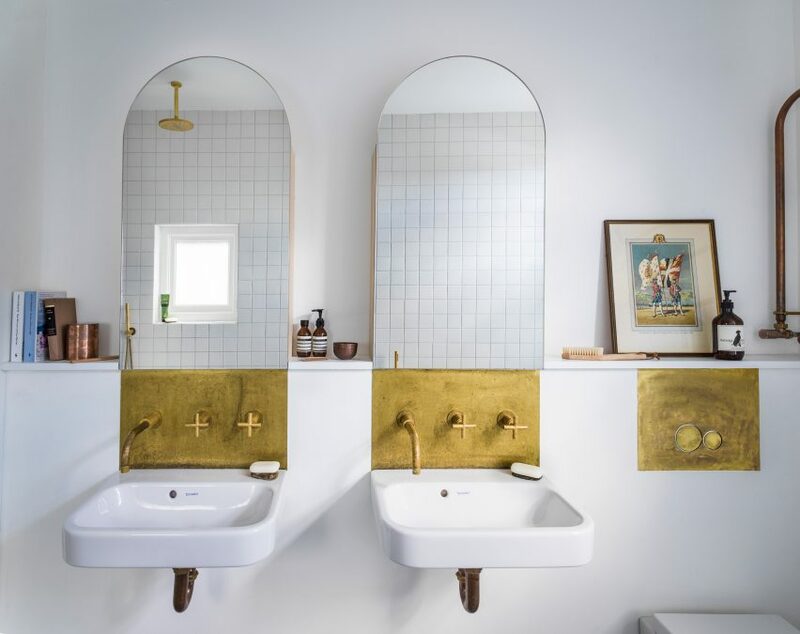 “The first-floor bathroom also follows the utilitarian theme with inexpensive taps stripped back to their base brass and matched with bespoke milled brass elements,” said Allen. 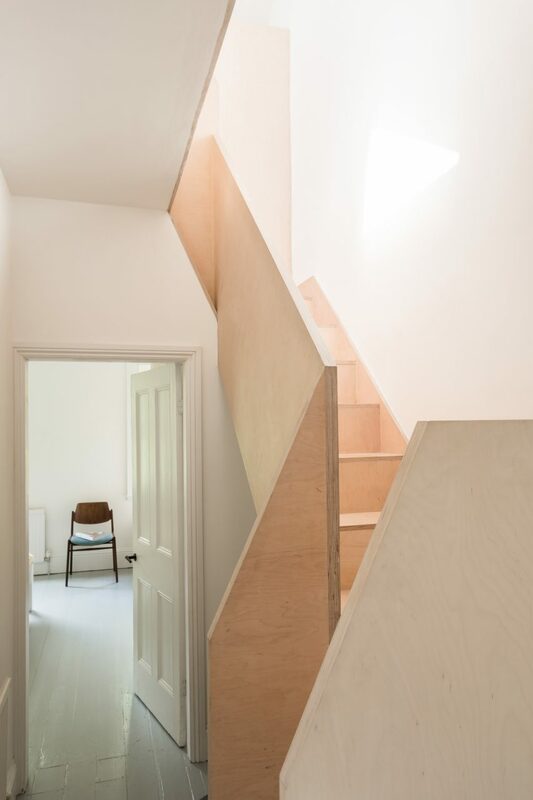 Built-in wardrobes in the bedroom and a new staircase leading to the attic were designed as a single element, interlocking through the central wall of the house. The birch plywood was machine milled via computer numerical control (CNC) and made as a kit of parts, saving on costs and allowing for quick assembly on site. Studio Ben Allen also used plywood to create a couple of children’s bedrooms in a flat on the famous Barbican estate in London, complete with arched doorways and hatches to allow for creative play. 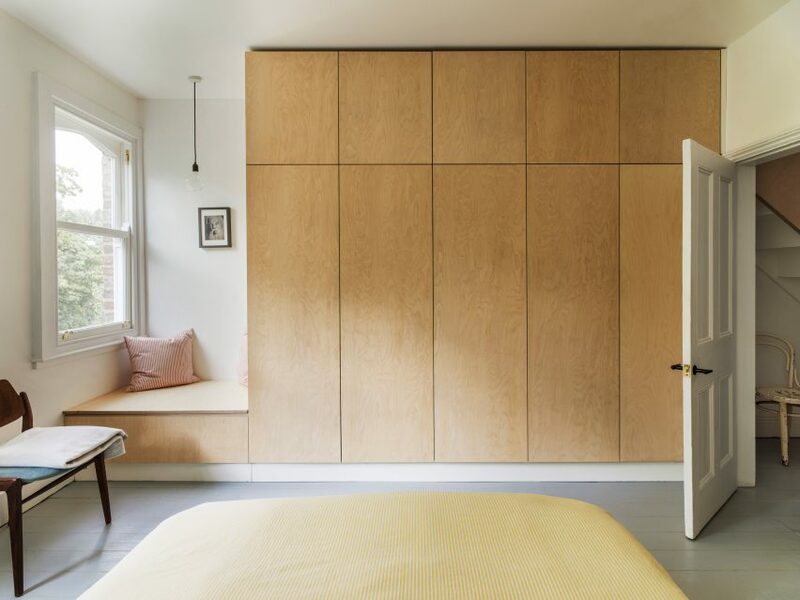 For another apartment, this time in north London, the practice added moveable wooden screens with perforated geometric patterns to create a more flexible living space. Be the first to comment on "Studio Ben Allen adds pair of brick vaults to terraced house in York"